Vineburg Machining can manufacture almost anything from a tube or block of metal just as Michelangelo produced David from a large marble slab. Have you ever use Google? The cameras used to capture images of your neighborhood are attached to cars with a mount made by Vineburg Machining. Critical parts for the M240 machine gun are also produced by Vineburg Machining before they're sent to U.S. Ordnance in McCarran, Nevada for final assembly. The gun is used to defend the United States against ISIS and the Taliban. Its bullets weigh 1/10 of a pound and can pierce through an inch of steel. Vineburg Machining also makes fasteners to hold wire in place in the walls of most passenger and military jets. 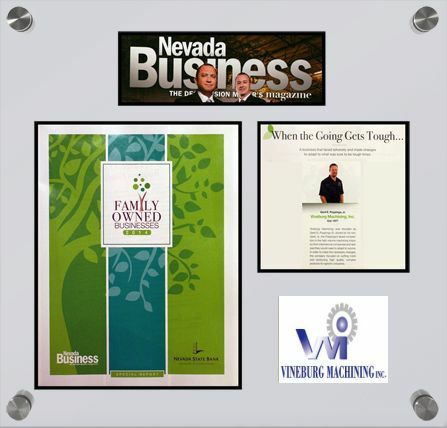 These are examples of thousands of parts the northern Nevada business produces. Each part is produced at the company's warehouse about 13 miles northeast of Carson City at 26 Stokes Drive in Mound House. The products produced there are often extremely high-end parts. 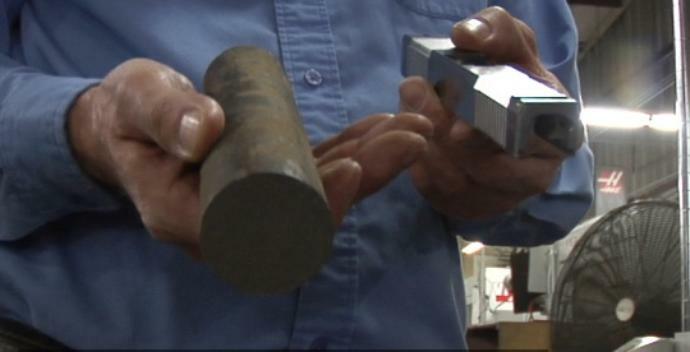 Other companies turn to Vineburg Machining when China can't make the parts they need. Sven Klatt is the general manager. "We never say no. So if customers come in with very complicated stuff it's maybe not possible at first glance. We usually pull it off somehow." The possibilities at Vineburg Machining are essentially endless because of its advanced machines. Many other manufacturing companies in China or the United States simply don't have them. "The advantage we have with the five-axis machine is we can move the five axis all at the same time," said Klatt. The five axis points controlled by a precision computer can produce basically anything, just as Michelangelo produced David from a large marble slab. "This is a gun slide we make, and it starts out as a routine piece of steel and when we're done with it, it basically becomes this," said Klatt. The production is staggering. Thirty-three workers produced 4 million parts in 2017 alone. The company can only do this with the help from robots. One is called the universal robot because it can do so many things. It can make a high security lock for Schlage. It could end up on a cruise ship or in a prison. This arm can work 24 hours a day and seven days a week. Klatt monitors it from his phone thanks to a camera set up near the robot. This CMM Coordinate Measuring Machine checks the work after it's done to make sure each part is true to the blueprint. The precision optical measuring of this machine can be mind boggling. "If you split a human hair about 15 times, that one piece would be about 2-one-thousands of an inch," said Vineburg Machining employee Bill Poleshuk. "We're talking cutting hair from the top to bottom right?" asked KOLO 8 News Now's Noah Bond. "Top to bottom, correct," Poleshuk responded. The story of Vineburg Machining's high-end approach starts in 1961 when the company's President and CEO Gerd Poppinga started his machining apprenticeship in Germany where he grew up. He moved to the United States and started Vineburg Machining in Sonoma, California in 1977. "We were in the high-volume machining industry and it went pretty well up until the mid-'90s, when a lot of my customers were asking me to lower my prices and said if I wouldn't they'd go overseas," Poppinga said. Many of his customers went overseas. Then the recession of 2001 shrunk his workforce from 100 employees to only 35. Combine California's higher taxes with this hardship and he felt compelled to move his business to Nevada in 2003. Seventeen families chose to follow him to the Silver State. 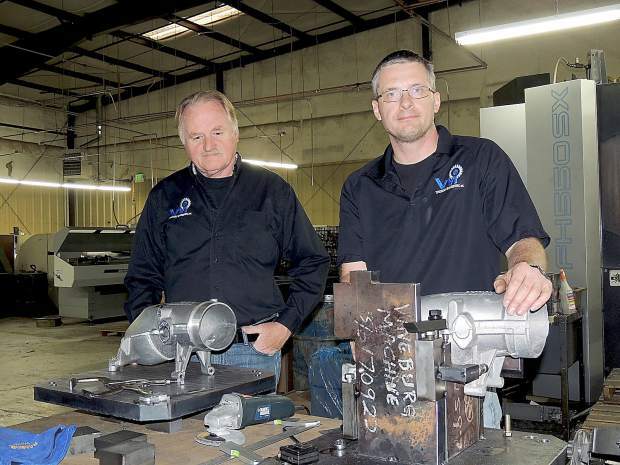 After the recession, Vineburg Machining Inc. started taking on challenging medical work, which meant taking up five-axis machining. Machinery from Haas helped cut scrap, reduce processing time and improve quality. As the business climate began to change around the year 2000, Vineburg Machining Inc. was at a tipping point. Its customers were sending work to China to save money, and owner Gerd Poppinga knew he had to take drastic measures to reduce costs. He packed up his shop, and moved operations and willing employees from California to Lyon County, Nevada, where the tax rates were lower and the cost of living was more affordable. Of course, there was more to the move than a new address. Mr. Poppinga also challenged his employees to change their high-volume mindsets and pursue more challenging manufacturing applications. By adding five-axis capabilities from Haas Automation Inc. (Oxnard, California), the company was able to take on medical work. Vineburg’s history is one of adaptation. Soon after Mr. Poppinga and four investors bought an Acme-Gridley machine shop that was closing its doors, he began looking for alternatives to cam-driven machines. In the mid-1980s, he purchased several used NC machines and eventually a CNC lathe. By 1997, the other partners had left the company, and Mr. Poppinga grew the business. However, when the recession hit, the shop was asked to lower its prices, and high-volume work started to dwindle. That’s when Mr. Poppinga decided to pursue more challenging work with customers who wouldn’t “beat him up for a nickel per part.” Screw machine work would remain as a steady portion of the shop’s income, but CNC was the future. That future began to coalesce when Vineburg purchased its first Haas machining center, a VF-3SS, to which it added a TR160 trunnion for five-axis machining capability. General Manager Sven Klatt had been struggling with high scrap rates on a difficult medical part, and the ability to machine multiple sides of the workpiece in a single operation brought immediate benefits. “The new machine eliminated setups and allowed us to run complex parts in a much more efficient manner,” he says. Happy with the performance of its first machine, and seeing potential to run similar jobs, Vineburg decided to purchase a second trunnion-equipped Haas VF-3SS a few months later. With this acquisition, the company found it could eliminate additional operations on a tool-steel part, one that was previously rough-machined before being heat-treated to 63 Rc. By cutting the part in its hardened state, the company reduced processing time and increased quality. Vineburg says it also tries to go the extra mile for its customers. For example, a customer from the UK needed custom muzzle brakes for an AR-style gun machined from 4140 material in two weeks. This was no small feat, as the part’s overall features are very complicated. After receiving the CAD drawing, Mr. Klatt worked the weekend, and the shop was able to deliver the parts as promised. Two years later, Vineburg is still making 2,000 of the parts each month. Today, the shop has 32 employees and 18,000 square feet of manufacturing space. The single Haas machine has been joined by nine others, with the most recent addition being a UMC-750SS. Three of the machines are UMC-750 machining centers, which Mr. Poppinga and Mr. Klatt first saw at an EMO machine tool exhibition in Hannover, Germany. Right away, the machine proved to be a game changer for the small but growing shop. The affordable five-axis milling machine enabled the shop to evaluate the type of work it was taking on along with its production methods. “It afforded us the ability to offer complex machining to existing and new clients, making us more profitable,” Mr. Poppinga says. When the UMC-750 arrived, Mr. Klatt ran some parts for the foundry up the street from the shop. It was enough work to book the machine solid. Within one week of receiving the first UMC-750, Vineburg ordered another. Similar experiences drove Vineburg to order additional machines. In fact, one such job was a prosthetic knee component made of cobalt chrome alloy. Prior to the UMC-750’s arrival, Mr. Klatt and his team were making the part in eight operations and suffering 30 percent fallout due to scrap. They retooled the job for the new machine and are now making the knee implant in two operations—turning and milling—with virtually no scrap, he says. Moreover, the move cut 15 minutes off the cycle time. complete complex five-axis milling applications. UMC-750SS Spotlight – Vineburg Machining Inc.
Vineburg Machining, Inc. has been manufacturing high-quality machined parts since opening their doors in Sonoma, California, in 1977. 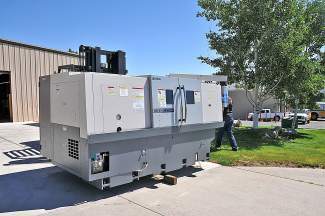 Since then, Vineburg has moved shop to Carson City, Nevada, and added a number of Haas CNC machines to their arsenal, including a new UMC-750SS vertical machining center. When compared to the production from their UMC-750, Vineburg saw a 16 percent reduction in cycle time with the Super-Speed machine. Take a look at the stats below to learn more about how Vineburg is saving time and money. Sen. Dean Heller talks with Sven Klatt, the general manager of Vineburg Machining Inc., and Gerd Poppinga, Sr., founder, of Vineburg on Wednesday. 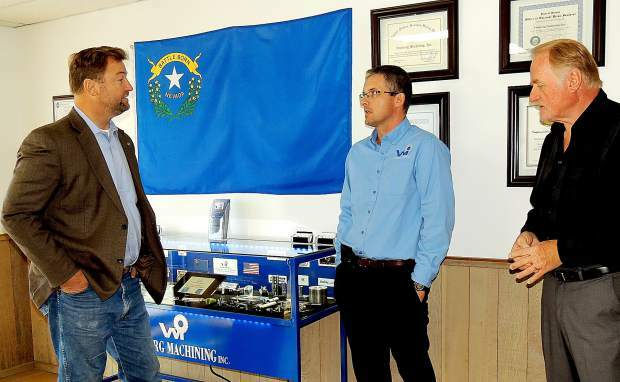 Sen. Dean Heller visited Vineburg Machining, Inc., in Mound House on Wednesday and said the world doesn’t know the hidden gem Northern Nevada’s industry is.“People don’t realize the great work that’s going on in this area,” said the U.S. senator, who told Vineburg’s brain trust he grew up spending much time in a similar business his father had in Carson City. The occasion for the visit was a tour of Vineburg with Gerd Poppinga, Sr., the founder, president and CEO, Sven Klatt, the general manager, and Gerd Poppinga, Jr., vice president, as well as representatives from Advantage Capital Partners. Advantage Capital infused $2.75 million in loan money under a federal-state program into the expanding machine shop under a New Markets program nationwide. Before the tour, Heller peppered the Vineburg executives about their machining work, the new equipment made possible by expansion money, the firm’s history and its customers. Klatt said Tesla Motors coming to Nevada, and the new machines are “opening doors” and the company currently has 134 active customers ranging from other local manufacturers like Click Bond, Inc., to national and international firms. He said much of the business from other area firms was garnered mainly by word of mouth over the years. He also credited the firm’s craziness at rarely turning away work. “We have the ‘yes, we can’ attitude and the new equipment,” Klatt added. The founder mentioned his firm came years ago from California as a survival move. He recalled California days in tough times, when he decided “we can’t do it here; it’s too expensive.” He said he brought along nearly 20 key people in his move of the firm to Northern Nevada. The Advantage Capital representatives on hand were Steven Stull and Scott Murphy, the latter a former congressman from upstate New York who had served with Heller in Congress before returning to the private sector. Murphy told Heller Advantage Capital had selected Vineburg for the loan program money last year because the executives there knew how to keep efficient in good times and bad, and are committed to training skilled workers. Two top executives from Vineburg Machining here, both of whom are natives of Germany, return there late this week building bridges via contacts by working with a Nevada trade mission. Gerd G. Poppinga, president/CEO of the Mound House corporation, and Sven Klatt, the general manager, head for Berlin to hook up with the trade mission to Europe led by Gov. Brian Sandoval. The pair, both trained in Germany before coming to Carson City, will be on hand to promote ties and look toward planting seeds for eventual worker training and pipelines, possible exchanges and enhanced Nevada industry training programs. “It’s going to show really nicely how big companies and small companies (there) work together to train the entire work force,” said Klatt, who also teaches manufacturing skills here at Western Nevada College (WNC). Poppinga agreed. “I’m sure that the governor is going to be impressed,” the president and CEO said. Poppinga, Vineburg founder, as a young man worked at a German firm that later became Electrolux. He did the apprenticeship training program there and at a trade school. Klatt, working for the same firm a generation later, did similar combined industry/trade school training. He subsequently joined Poppinga here and manages a staff of more than 30 working with various machines, including state-of-the-art Five-Axis units Poppinga calls the pinnacle of the trade. Klatt chimed in the computer software involved in precision machining work the firm does has made significant advances in the past decade, so the combination means ongoing training is crucial. He said planting seeds for worker exchange is in too preliminary a stage to talk much about, but he did share Vineburg intends to send a worker to Germany to undergo perhaps a year of advanced training. Poppinga said the combined industry/trade school work and apprenticeship program he and Klatt went through took more than three years. One day each week was in trade school classes, the rest at the manufacturer for which they worked. Even at the firm, he said, classwork training was included along with the work. Employees took a turn in various roles to learn machining, milling and other necessary tasks, the pair said, and there were continual tests. “It is really too bad we don’t have that here,” Poppinga said. Klatt, however, noted efforts by Northern Nevada educators and others to provide pertinent education or training for people entering manufacturing are growing. Poppinga lamented the fact workers are needed now and that “everyone focuses on engineers,” though well trained workers with proper skills also are crucial. “They have to have a skill set,” he said. “We’re not up on that. We need to do better.” Klatt said the trade mission, programs at community colleges like WNC and even at the high school in Carson City show understanding is growing and progress is possible. “This trip shows everyone cares,” he said. Both men, however, stressed word of opportunities in industry needs to reach students and their parents so more will consider entering the manufacturing field. Poppinga cited one Vineburg employee who’s in his 20s and makes $50,000 annually, has no student debt and has the skill set that makes him valuable long term. The European trade mission includes five nations and involves the governor, his office of economic development, others in the economic development field and various representatives of government, business and industry. Among those in the delegation is Nick Marano, Carson City’s city manager, who’s focused on luring technology companies to Nevada’s capital from Poland. Also on the itinerary are Ireland, England and Italy along with Germany and Poland. The pair of executives from Vineburg is spending about a week in Germany from Friday through July 30. Poppinga and Klatt said they will join the delegation in Berlin and travel with it to Dresden and Leipzig with stops that include major manufacturers like BMW, a BMW supplier, Porsche and a Collaboration Workforce Training Center. Poppinga said his machining firm likely is the smallest from industry here joining the trip, saying larger local manufacturers like GE Bently in Douglas County and Click Bond in Carson City as also sending representatives. 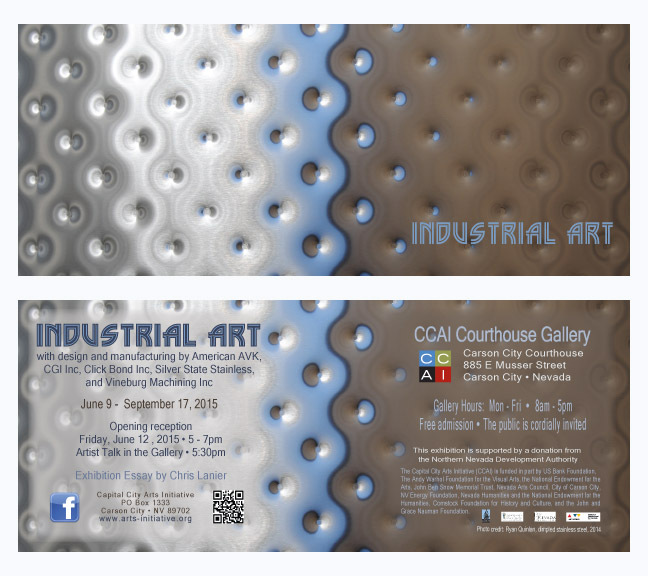 Carson City, Nevada — Embracing the area's design and manufacturing community, the Capital City Arts Initiative [CCAI] announces its exhibition, Industrial Art, at the CCAI Courthouse Gallery from June 9 – September 17, 2015. CCAI will host a reception for the show on Friday, June 12, 5-7pm including a short introduction of the exhibition participants at 5:30pm. The Courthouse is located at 885 E Musser Street, Carson City. The reception and the exhibition are free and the public is cordially invited. The gallery is open to the public Monday – Friday, 8am – 5pm. Industrial Art presents the design work of five manufacturers in the Carson City area including American AVK, CGI Inc., Click Bond Inc., Silver State Stainless, and Vineburg Machining Inc. These companies manufacture products with innovative design that applies to an array of commercial applications. CCAI presents these products, created for specific industrial uses, as items to be admired in their own right for their design, precision, and beauty. American AVK in Minden manufactures fire hydrants, objects so common place that we tend to not notice them, with colorful housings containing many precision valves. CGI Inc. creates products for a variety of industrial applications from precision gearboxes to electro-mechanical items for aerospace systems to semiconductor applications. Click Bond Inc., home of the original adhesive bonded fastener, specializes in ways to fasten items together with structural adhesives for the international aviation industry. Silver State Stainless manufactures stainless steel tanks for the beer, wine, and food industries. Vineburg Machining Inc. creates precision-machined components for the aviation, automotive, and medical fields. Each of these firms relies on product design and research to keep them on the leading edge of their industries. The show includes a brew tank constructed by Silver State Stainless specifically for the exhibition, a fire hydrant, and numerous gears, prosthetic devises, and intricate elements. Many of these internal and vastly unappreciated components are critical to keeping our world running and on time. Artist and writer Chris Lanier has written the exhibition essay for Industrial Art. He has a background in both traditional and digital media, and has worked in multimedia performance, digital animation, web production, and comics. Mr. Lanier is also an essayist and critic whose art criticism has appeared in a variety of online and print publications. He is an Associate Professor of Digital Art at Sierra Nevada College, Incline Village, Nevada. Lanier earned his M.F.A. in Studio Art at the University of California, Davis in 2007 and his B.A., Art and Society at the New College of California, San Francisco in 1994. He lives in Reno with his family. This exhibition is supported with a donation from the Northern Nevada Development Authority. The Capital City Arts Initiative is an artist-centered organization committed to the encouragement and support of artists and the arts and culture of Carson City and the surrounding region. The Initiative is committed to community building for the area's diverse adult and youth populations through art projects and exhibitions, live events, arts education programs, artist residencies, and online projects. CCAI is funded in part by The Andy Warhol Foundation for the Visual Arts, National Endowment for the Arts, John Ben Snow Memorial Trust, Nevada Arts Council, City of Carson City, NV Energy Foundation, U.S. Bank Foundation, Nevada Humanities and the National Endowment for the Humanities, Comstock Foundation for History and Culture, and the John and Grace Nauman Foundation. For additional information, please visit CCAI’s website at www.arts-initiative.org. Click on link or image below to read about the Nevada Sierra Region and the article on VMI page 4. Gerd E. Poppinga, Jr. Vineburg Machining, Inc. Est: 1977 Vineburg Machining was founded by Gerd G. Poppinga Sr. Joined by his son, Gerd, Jr., the Poppinga’s faced competition in the high volume machining industry from international companies and realized they would need to adapt to survive. In order to make the necessary changes, the company focused on cutting costs and producing high quality, complex products for specific industries. . . .
During a short trip to tour a Mound House machine plant, Carson City Mayor Robert Crowell said Thursday that manufacturing is an important slice of life in the city and region. “In my language, it creates wealth,” he told Gerd Poppinga, founder and president of Vineburg Machining. The firm’s new and expanded plant makes machine parts for medical, transport and other industries. The mayor said the industrial park to which Vineburg moved from a smaller plant seems to have grown since he last visited, and he plugged regional manufacturing growth. He also said a larger pool of skilled labor for such technical work is important, decrying the current situation. “I just wish there were a bigger pool,” he said. The mayor supports retaining a strong Western Nevada College in part because it helps train such workers. Sven Klatt, Vineburg general manager who was helping with the tours, teaches at WNC and wants the same growth in the number of skilled workers about which Crowell spoke. Poppinga told the mayor there are thousands of such workers in Germany. Both Poppinga and Klatt, a generation apart, got their machining educations in the same place before emigrating to the United States. The tour was part of back-to-back events involving a meeting of 26 members from the manufacturers’ forum of the Northern Nevada Development Authority (NNDA), followed by the open house and tours. On hand along with the mayor were a host of manufacturers, skilled-worker-training experts and manufacturing development representatives or supporters. Among the latter group were Kris Holt of Nevada Business Development, Andrew Haskin of NNDA, Roger Kadz of the Nevada State Development Corp. and Ray Bacon of the Nevada Manufacturers Association. 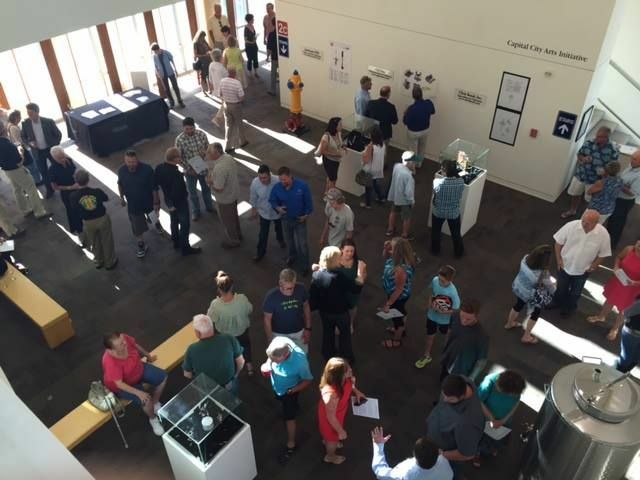 There were even representatives of the Carson City Arts Initiative (CCAI), touting four art pieces associated with industry themes that Poppinga and they were displaying at the new Vineburg headquarters. Sharon Rosse and Glenn Clemmer were among the 75 people or so that Vineburg says attended in their bid to promote manufacturing. “Our primary goal is to make Northern Nevada a major player in the manufacturing industry,” Poppinga said in his invitation. The open house and tours were to run from 4 to 7 p.m.
Manufacturers from Carson City and the area have Chinese rivals in the cross hairs if Nevada taxes or regulations don’t spoil their aim, according to regional light-industry leaders. That was the gist of remarks Wednesday at a breakfast meeting of Nevada Business Connections, a private-sector economic development networking organization based in Northern Nevada. Frank Dutra, who is with Advanced Machining Techniques and Hubzone Manufacturing in California and Nevada, made those comments during a panel presentation. Dutra said several original equipment manufacturers he deals with have bad experiences with Chinese work. Texas is a primary competitor with Nevada in the United States, Dutra also said. 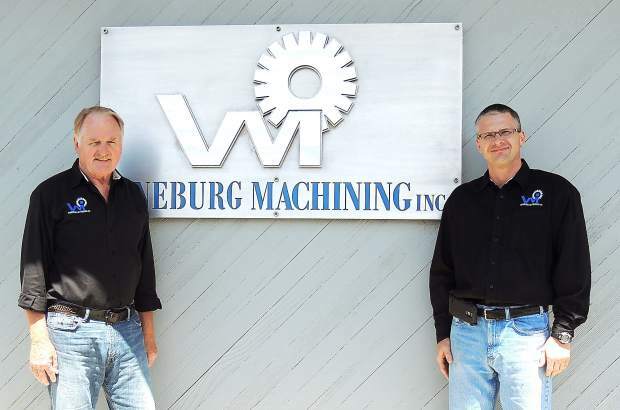 Gerd Poppinga and Sven Klatt of Vineburg Machining, which has a Carson City address and is in a Mound House industrial park, talked about Vineburg expansion as Klatt took a bead on China. Poppinga, the founder, and Klatt, the general manager, both came from Germany. They talked of their German training and state-of-the-art machines while explaining Vineburg’s survival to the current growth mode. Also on the panel of manufacturers was Stephen VanDerver of Vital Systems in Reno, who said his company is about to add another work shift and many manufacturers see this as a time for optimism. Ray Bacon of the Nevada Manufacturers, the NBC breakfast panel moderator, chimed in on the China-in-the-cross-hairs theme, yet he also warned of problems that could still trip Nevada industry up over time. “We can do on-shoring,” Bacon said. “We can be competitive.” He said China’s wages go up 15 percent annually, and the Asia giant’s industrial operations aren’t efficient. But he criticized a proposed Nevada margins tax on business and any altering of the state’s regulatory environment in ways that would hamper Silver State firms, whether current companies or those transplanting to Nevada as the economy keeps recovering. Bacon cheered the business breakfast audience by saying the state margins tax plan can be turned away when its fate is decided in November. He said signs indicate labor organizations with workers in the private economy won’t or may not support the tax. “This thing can be defeated at the ballot box,” he said. Founder/CEO Gerd Poppinga left & GM Sven Klatt at Vineburg Machining earlier this week. Vineburg Machining Inc. recently moved to new and larger digs, has purchased top-flight equipment and projects that 20 percent output gains are in the offing. The closely held corporation, which has a Carson City address at 26 Stokes Drive in a Mound House industrial park, moved into a plant of nearly 19,000 square feet there, leaving behind a 12,500-square-foot facility a couple of blocks away on Brown Drive. The firm, founded by President and CEO Gerd Poppinga, has 32 employees along with the expensive milling equipment. “The people who work here have an opportunity to learn state-of-the-art machining,” said the founder. The comment came during an interview with him; Sven Klatt, Vineburg’s general manager; and Poppinga’s son, also named Gerd, Vineburg’s vice president. The elder Poppinga and Klatt said it is difficult to predict gains, but Klatt ventured the 20 percent projection. The trio recounted the firm’s history, saying it reached nearly 100 workers in 1999 while still in California. But then it fell on tough times, dropping to 40 workers in 2003. The decision to move to Nevada was made late that year, and 17 made the trek to join in the permanent relocation to the Carson City area. The firm immediately hired five, but the economy tightened and Vineburg’s crew dropped to a dozen in about 2005-06. Now back to more than 30 employees, the company makes an array of parts and products using the new machinery. “It enhances quality drastically,” said Klatt, who joined the firm when he moved to the United States from Germany in 1998. He said that when he arrived, he didn’t speak English. He made a connection then with the Vineburg founder through a mutual acquaintance in part because Poppinga, who previously emigrated from Germany, had gone to the same machining apprenticeship school in Oldenburg 30 years earlier than Klatt. Oldenburg is in northern Germany. The firm’s vice president, meanwhile, said Vineburg made it through difficult times that preceded recent gains by doing machining for medical needs and commercial locks. He and his father particularly focused on the commercial lock market as a savior during the downturn years. “The worldwide scope of it has helped,” said the younger Poppinga. Klatt said perhaps $2 million worth of the best machining equipment purchased the past three years. In addition to putting in many hours at the plant, Klatt teaches at Western Nevada College, a role that in part stems from one of the industry’s dicey problems. Vineburg’s founder chimed in, saying the lack of a trained work force for machining and manufacturing can be a problem nationwide. The Western Nevada College Manufacturing Lab received $1 million in new machinery. Austin Lambert's "The Archer" has found a permanent home outside the WNC Andy Buttie Welding Technology Center. Machine tool technology students at Western Nevada College will benefit twofold from new machinery provided by Gosiger Inc. and a grant that will upgrade the hands-on technology center. Not only will WNC students learn to use some of the latest computer numerical control machines, they will be under consideration for employment by local manufacturers that visit the campus to see demonstrations of the machines. “It’s a win-win for us,” said machine tool technology Professor Paul Eastwood. “They lend us the machines for instructional purposes, and they come in to demonstrate them to local manufacturers. The Okuma Turning Center and Harding Milling Center are CNC machines from Gosiger’s Fullerton, Calif., plant. By moving them to the Woody Wurster Machine Tool Technology Center at WNC, students can learn the specific skills that manufacturers are using. Each of the CNC machines will use Mastercam software, giving students another skill that should benefit them as they seek employment. Sven Klatt, who began teaching CNC programming at WNC last year, helped broker the deal for the new machinery after being approached by Gosiger representatives. “They had done cooperative programs with schools throughout the United States. I put the right people at the college in contact with Gosiger,” Klatt said. In addition, a separate grant has allowed WNC to purchase a Haas CNC Turning Center machine, which has just arrived at the college. Eastwood said the machines have been installed and will be operational in time for fall classes. Western Nevada College student Austin Lambert has combined his welding skills with his artistic talents to create an award-winning sculpture. Now, his work has found a permanent home outside the WNC Andy Butti Welding Technology Center. “The Archer,” a life-size sculpture of a man pulling back a bow, took first place in the ceramics and sculpture category during the college’s 2013 student art show in Carson City. Lambert originally welded a smaller version of the sculpture while attending Douglas High School in Minden, then created the life-size tin version in his welding class during the spring semester. Lambert said he was inspired to create a larger rendition to display outside the Welding Technology Center, offering it a signature piece of art. Northern Nevada manufacturers are banding together to build a virtual one-stop shop for customers. The idea is to link local manufacturers with varying skills and expertise in a dispersed assembly line that can quickly respond to orders. The goal is to attract more work and in turn create more jobs and turn the area into a haven for contract manufacturing. The backbone of the project is a supplier database built and hosted by NVA250. That database was funded in part by the Governor’s Office of Economic Development, which has identified manufacturing as a key industry in the state’s economic future. The database contains detailed information on 200 manufacturers that can be searched using precise criteria such as materials, machine types and part size. The group is continuing to develop it and plans to add more features, including an interface to computer-aided design programs which would assemble a Nevada-based supply chain for a product as it’s being designed. But NVA250 is working with a smaller group of manufacturers — about 15 right now, says Clark — to coordinate their work on some initial forays into producing products using the team approach. The California customer hopes to duplicate that environment here, says Kucjaz, who says he moved to northern Nevada largely because of the manufacturing know-how. Several manufacturers are working on the project, passing off parts to one another as the pieces move back and forth down the virtual assembly line. Advanced Materials and Manufacturing Technology, for example, is developing material for a piston and needed a 3D scan of the part. So Tripp Enterprises Inc. in Sparks scanned the piston for AM2T. “We gave them a piston and they did the 3D scan and produced data files for a CNC (computer numerical control) program which we in turn gave to a manufacturer in Carson City and said here’s the files, here’s the materials, now fabricate the pistons,” says AM2T owner Henry Meeks. The machine shop in the production chain was Vineburg Machining Inc.
Meeks estimates having access to Tripp’s 3D scanner cut production time in half. Meanwhile, Betra Manufacturing is working on incorporating in the engine the lightweight aluminum it is beginning to work with. So far, all the manufacturers are pleased with the results. Gerd G. Poppinga: Vineburg Machining, Inc. is a 33-year-old, family-owned and certified full-service machining job shop. We serve multi-industry original equipment manufacturers and manufacturers throughout the U.S. We currently machine 7 to 10 million custom parts a year from all types of metals, for companies like Schlage-Lock (Ingersoll-Rand). We moved to Mound House from Sonoma, Calif., in 2003, with a staff of 18, plus their families. NNBW: What role do you play in the company? Poppinga: My responsibilities specifically include ownership concerns, project estimator, oversee sales and marketing, and technical and engineering; support of staff and customer service. NNBW: How did you get into this profession? Poppinga: Through a trade school and apprenticeship in Germany. NNBW: What is something no one knows about your job? Poppinga: The amount of knowledge needed to perform all aspects of running a machining business from technical, to accounting, to sales and marketing. Even more so, the smarts to survive the ups and downs of business cycles and challenges like offshore outsourcing, 9/11, and the most recent recession. NNBW: If you could have had any other profession what would it have been? Why wasnt it your first choice? Poppinga: After my apprenticeship in machining, I wanted to become an engineer. Instead I first came to the U.S. to learn English, and stayed after two years in the military. I continued on in machining, started a family and eventually started my own business. At one time I wanted to be a forest ranger because I love the outdoors, then a cook because of my love of different foods. The only solid opportunity at the time though was to continue in machining. NNBW: What do you like to do when youre not working? Poppinga: Motorcycling, hiking and golf. NNBW: Have any advice for someone who wants to enter your profession? Poppinga: Its a tough choice but rewarding if youre good with your hands and love to create something people will use. NNBW: If you could have one superpower, what would it be and why would you want it? Poppinga: I would just love to have the power to improve the human condition. NNBW: What person, living or dead, would you most like to have dinner with, and why? Poppinga: Multiple people actually; mainly those who wrote the U.S. Constitution because they changed my thinking about what freedom and opportunity mean. NNBW: Whats the best advice anyone ever gave you? Poppinga: Do unto others as you would have them do unto you. NNBW: What do you like most about your job? What do you like least? Poppinga: I enjoy technical challenges, and dislike repetitive aspects of the job. Name: Gerd G. Poppinga, president, Vineburg Machining Inc.
How long in the profession? Since 1961 Education: Trade school in Germany, then college in the U.S.
Whats on your iPod? Diverse selectionoldies, rock, country western, classical, and opera. Spouse, kids or pets? Ismenia, wife of 42 years and two kids. No pets. Vineburg Machining Inc. has fingers in a lot of products. The Mound House shop turns out parts for everything from race cars, surgical units, military medical units, locks and pet products to Humvee repair kit parts.“We go through a million pounds of metal a year,” says company owner Gerd G. Poppinga. His son, Gerd E. Poppinga, director of operations, tells how the company needed 12 flatbed trailers to move Vineburgs massive milling machines from Sonoma five years back.For decades, the company turned out parts with those 15 Acme multi-spindle machines that dated from the World War II era. And while those workhorses still pull their weight, since moving to Mound House the shop floor has seen dramatic change with the addition of eight CNC — Computerized Numeric Control — machines, costing about $250,000 each.For Vineburg, the Sept. 11 attacks in 2001 provided the impetus for change. The resulting economic seizure combined with the trend toward outsourcing work to China to deliver a devastating double punch. “With the general economy not going so well, we needed to cut costs and look at a different business model,” says the elder Poppinga. “I looked at where manufacturing would be in five to 10 years. We thought of specialty markets within the greater machine industry.”He was proved right. However, the move from mass milling to specialty provider meant shrinking the company, which employed 100 at its peak, to just 25. The move to Mound House was a further cost-cutting move. But it delivered a pleasant plus in the form of a reliable power grid, says the younger Poppinga.“In California,” he says, “we were constantly suffering brownouts.” Before the move, the Poppinga family already knew the Reno-Tahoe area as tourists. And, having bought a house at Dayton Valley Golf Course as an investment property, the elder Poppinga knew of the industrial park at Mound House. He worked with Kris Holt, then leasing agent at Grubb & Ellis commercial property, to lease a 13,000-square-foot building at Mound House. Of Vineburgs 25 employees in Sonoma, 18 chose to move their families to Nevada. “I never readjusted their pay,” says Poppinga, which sweetened the deal. But those longtime machinists were familiar with the manual Acme machines used for high-volume runs. The companys move to the more precise runs required for specialty medical and automotive parts required more workers on the computerized machines. For the most part, the younger Poppinga, who has a degree in strategic business management, helped train employees with the new technology. Training remains an ongoing issue, as each new job comes into the shop. 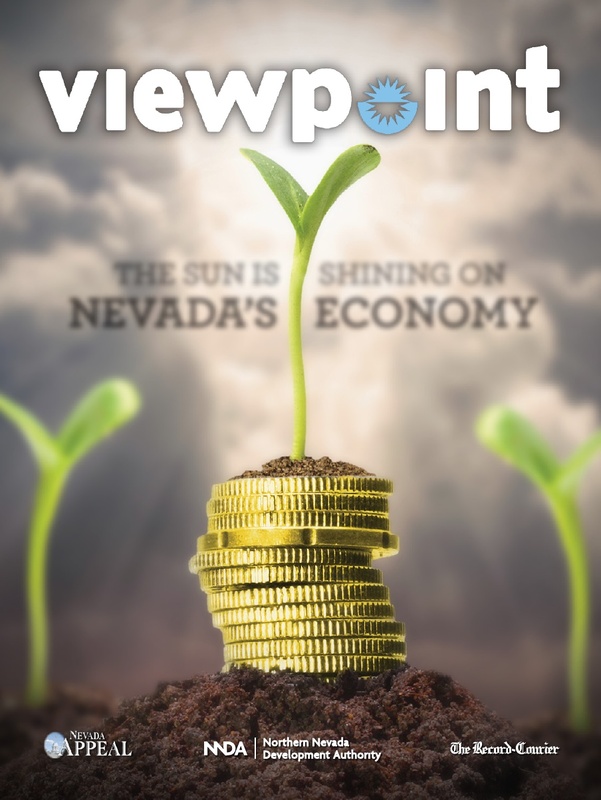 The best way to confront the shortage of skilled workers in northern Nevada, says the companys founder, is to keep existing employees on board.“Treat them like a family member,” he says. “We provide everything: above-average income and training and pension. We pay bonuses when were doing well. And we hold company lunches, picnics and outings.” Finally, he adds, “I trust them, I dont look over their shoulders.”The old guard machinists, those able to set up a job by hand, are retiring — and the dearth of young people entering the trades has left a void. But new grads holding computer degrees also need mechanical aptitude, says the younger Poppinga, as well as the ability to visualize in three dimensions. Competition from China remains tough, but the Mound House company contends that turnaround time for a job at Vineburg is four weeks compared to six months for work sent overseas.An overseas order must be big enough to fill a shipping container, and an independent inspector often is needed on-site to oversee offshore manufacturing. However, the elder Poppinga points to a neighboring company that had to junk 60 percent of an order, incorrectly made. “Yet its still cheaper for them to outsource to China,” he says. Vineburg Machining, Inc. (VMI) is a Sonoma-based company that creates machined parts for construction tools, medical implements and automotive parts. Their client base is local, nation-wide and international. 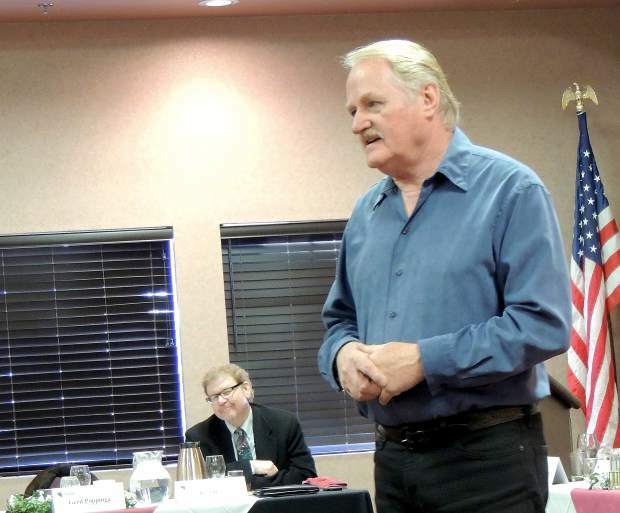 VMI's president, Gerd Poppinga was interested in a variety of company-wide training. The VMI management team, composed of managers, supervisors and team leaders, had just been formed and needed management training. Increasing customer demands with more complex specifications and a general upgrading of processes was pushing the need for training on the line. Poppinga also wanted training in ISO 9000 compliance, statistical training and machine shop blueprint reading. The company was concerned with maintaining production rates while employees were off line in training. Although, training was a priority for this manufacturing company, they were also concerned about the cost. One of VMI's managers learned about Employment Training Panel (ETP) grants from a consultant whose services were too expensive for the company. When they discovered SRJC's Workforce Training Department could provide the training and access to ETP funds, which would cover most of the training costs, they signed up. The training plan for the forty production employees included Problem-solving and Statistical Process Control. Blueprint Reading was added for the machine shop, and managers took an additional 24 hours of Quality Management training. To launch the program SRJC's Workforce Training Coordinator, working with Poppinga and his Technical Support Manager, Bill Poleshuk planned three all-day Saturday sessions to introduce ISO to all of VMI employees. Poleshuk says that many in VMI's blue-collar work force did not initially see the value of leaving the production line for training. One of the outcomes of the training was that employees became more proactive and questioning in their jobs. “Now our employees are confident asking for help because they see it as a part of their job. The company operates more like an inverted pyramid. Rather than waiting to be told what to do and when, employees do the work and tell management what they need,” commented Poleshuk. Besides upgrading the standards and practices at VMI, Poleshuk reported a result that surprised the entire management team. When they reviewed financial records for the training period, production was not adversely affected as had been anticipated. “We expected a negative financial impact, and were very pleased that we could provide training and stay profitable during the same period,” Poleshuk added. MOUND HOUSE - Gerd Poppinga had to make the hardest decision to ever confront a business owner. Poppinga, 59, started his business in 1977 in Sonoma, Calif., but moved it to Mound House recently for economic reasons. About half of his 35 employees decided to also make the move. So in November 2003, the multimillion-dollar equipment essential to Vineburg Machining Inc.'s business was transported on 14 semi-trucks to Northern Nevada. Poppinga was born in Germany, but arrived in California just in time to be drafted into the Vietnam War, where he served from 1966 to 1968. Soon after returning, he married a Panamanian woman named Ismenia, and they have two children. His son, Gerd Jr./COO, also works at Vineburg Machining. "We used to have 90 employees in 2000, but due to the recession, our business was slowly going down in the number of employees," he said. "We dropped to 35 employees at the end of 2002-2003." Poppinga said the semi-conductor industry was in decline so he decided to downsize. His biggest customer was going into a redesign; other customers were going overseas. Poppinga already owned a house in Dayton, so this area became his first choice. "When I had to make the decision, I looked at the business climate in Nevada and its infrastructure. Our type of business relies on raw materials from the Bay area and Southern California. I found that Mound House had a good support line." His 13,000-square-foot shop is broken into two parts, but it all sounds the same: the grinding cacophony of industry. One half contains about $1.1 million in computer-operated machines. These digital machines are for the precise pieces, but they have a short lifetime and need diligent maintenance. The other half of the shop is dominated by 13 mass-producing machines, each worth from $50,000 to $150,000. These machines are for producing high volumes. Poppinga said they're all American-made and will last for decades. Although he isn't employing the same number of people that he had before the recession, 25 machinists work in the machine shop, Poppinga said he is establishing bonds with other industry in Carson City. Vineburg is a contract shop that doesn't make any of its own products. It has contracts to make such things as door locks, parts for fire pokers, orthopedic devices, animal feeders and racing cars. The products are shipped to Mexico, Colorado, California and Nevada. "I like to work with the engineers from various companies that we do work for. They come to us with a specialized process. They want to take a new design to market, and they come to us to make it as low-cost as possible."